We have developed a phagemid vector (pJuFo) for the selective isolation of genes encoding proteins for which a ligand is available. The physical linkage of cDNA-encoded proteins to the genetic information required for their production was achieved by exploiting the high affinity interaction of the Jun and Fos leucine zippers. The gene encoding Jun preceeded by the pelB leader sequence placed under control of a lac promoter/operator element was cloned as N-terminal fusion to the minor viral coat protein gIII. The Jun/gIII fusion protein become structurally incorporated into phage particles during infection with helper phage. The gene encoding Fos, proceeded by the pelB leader sequence was coexpressed from a second lac promoter/operator as N-terminal fusion peptide to cDNA encoded proteins. The resulting Fos-fusions secreted into the periplasmic space of E. coli could become associated with Jun-decorated phage particles and thus displayed on phage surface. To avoid dissociation of the Jun/Fos heterodimeres cysteines were engineered at the N- and C-termini of both leucine zippers providing a covalent link of the cDNA gene products to the genetic information required for their production. The vector allows the construction of phage display cDNA expression libraries which can be screened by biopanning in microtiter plates coated with a ligand exhibiting affinity to the gene products of interest. The expression products from a cDNA library from Aspergillus fumigatus, a mold known to produce more than 40 IgE binding proteins, have been displayed on the surface of phage Ml3 using pJuFo. 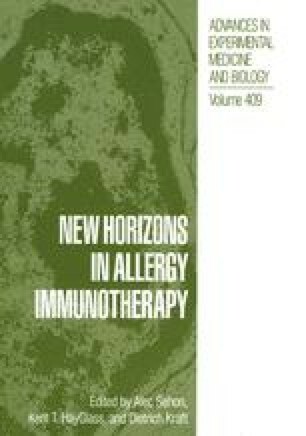 Phage displaying IgE-binding proteins were selectively enriched over non-specific phage by consecutive rounds of growth and selection in a microtiter plate coated with serum IgE from allergic individuals. A vast variety of phage encoding and displaying different IgE-binding proteins with an apparent molecular mass ranging from 20 to > 40 kDa were isolated from this library.